Update 2: Windows 10 PC Insider build 15002 is now available for fast ring members. The latest insider build brings many new features to Windows 10. Check out all new features in build 15002. The build also brings bug fixes and some known issues. Check out the complete list of known issues with build 15002. Update: Windows 10 Creators Update build 15002 (15002.1001) leaked online. For more details read here. Original Story: Microsoft is now testing Windows 10 Creators Update insider build 15002 for PC and build 10.0.15002.1001 for mobile devices. 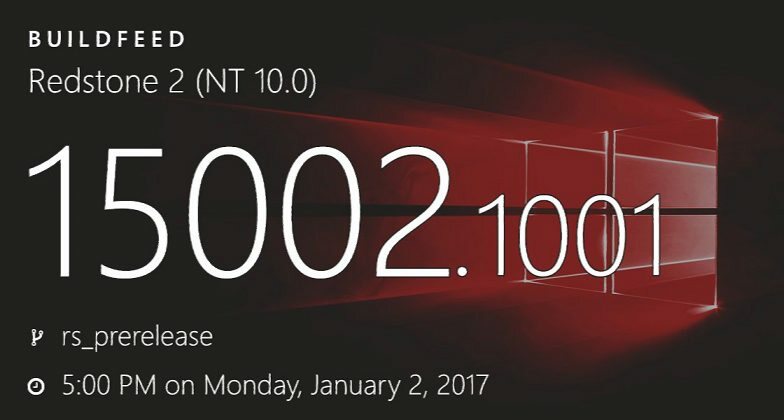 The new Insider build 15002.1001 was compiled on January 2. Meanwhile, the company released a new cumulative update KB3209835 build 14393.594 and mobile build 10.0.14393.594 for Insider Release Preview ring members. Soon, this update will be available for everyone. However, Microsoft may also release previously tested update build 14393.693 for customers. Also, Windows 10 Threshold 2 users can expect update build 10856.753 next week.